To make the crust, in a large mixing bowl, stir together flour, sugar and salt; knead in butter cubes, using fingertips, until well incorporated and pea-sized lumps form. Gradually sprinkle milk into flour mixture, and stir until well combined. Gather dough into hands and form a ball; flatten into a disc. Wrap in plastic wrap and chill in freezer for 20 minutes. To make the pie crumbles, in a large mixing bowl, stir together flour, sugar, cinnamon, ginger and salt until well combined; knead in butter cubes, using fingertips, until well incorporated and pea-sized lumps form. Place bowl in refrigerator to chill. To make the pie filling, in a large mixing bowl, whisk together eggs, molasses, corn syrup and baking soda until well combined; gradually whisk in hot milk until well combined. On a lightly floured surface, using a floured rolling pin, roll out pie dough thinly; place into a 9-inch pie dish. Fold over pie dough edges and crimp. Reserve 3/4 cup pie crumbles. Stir the remaining pie crumbles into molasses mixture until just combined; pour filling into pie shell. Sprinkle with remaining 3/4 cup pie crumbles. Bake pie for 45 minutes or until set and golden brown. Cool on a wire rack. 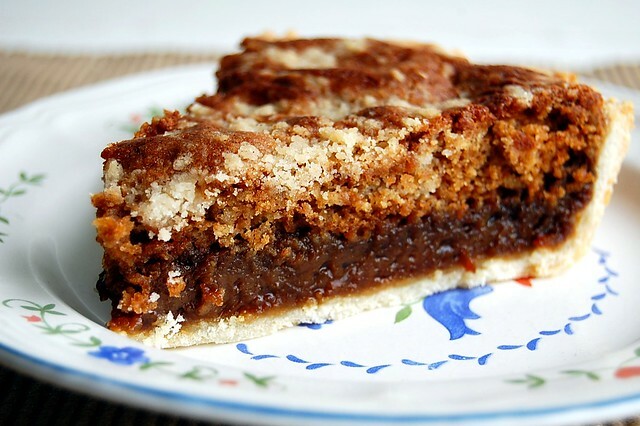 36 comments on "Shoofly Pie"
Simply delicious! Happy Mother's Day! i love the pics of you hiding behind the bush and the health food store shots....thanks for posting all those! I remember buying this pie from the mennonites at the farmers markets back home in the east. I have never attempted to make it, so that needs to change. 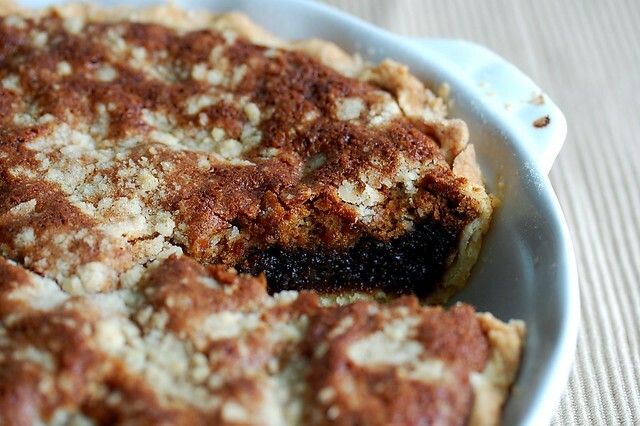 Shoofly Pie! Are we sisters? Just wondering because I made the same thing last weekend- I have yet to post it but that is so funny! I mean so ironic! I did use nuts though because we can't live without them! Love your version! We should do the same recipe sometimes but with different versions and have our readers check out the other? Just and idea because it seems we are on the same page lately! LOL! When I used to live in Maryland, we would always go to the Pennsylvania Dutch markets. They have a similar assortment of goodies like you pictured, and baked goods that make me drool just thinking about them. Authentic whoopie pies, cinnamon buns and yes, even Shoofly Pie! Yours looks phenom! I bet I would love this pie - anything with cinnamon and ginger makes me happy! Love the umbrella pics. I need one of those! And that store looks really neat! Would you send this post to my kids and have them sign it? Except for the part about being a great gardener, it could apply to me...Oh. and being a teacher...and being such a sweet nice mother...except for all that. I love the idea of "calming" the molasses flavor. Great recipe! This pie looks great! And it looks like you had a great time at the Amish store. =) I would go crazy in there and blow my whole grocery budget! Brings me back to my college days in Lancaster County, PA. Happy belated Mother's Day to Mom! You're a lucky woman. Oh my god I could LIVE at that Amish store! I wonder where I could find one around here. Never had shoofly pie before, but one of these days I think I have to. For the experience. And to see if I miss the pecans. interesting pie... i've never tried it, but i'm not sure it'd be my favorite either. 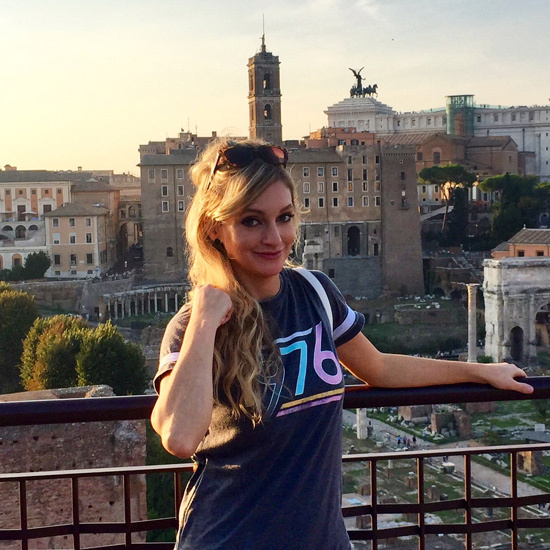 that picture of you and your mom behind the bush is too cute! My mom used to be a teacher when we lived in Texas, too! This looks so good. I've never made a shoofly pie before, but now I feel like I need to drop everything and bake it right now. moms ARE awesome, i always wonder how they manage to juggle so many things at once and do it so gracefully too. Shoofly pie?? I don't know about the name...but it looks delish. I am in LOVE with that store, love all the plain packaging. Lovely mother, and super pie! Love the look of layers in it. i am drooling equally over that amish store and the pie! i love how a trip to that store inspired you to bake the pie! those spices and candies and flour have me wishing i was there! Your mom sounds like a wonderful lady! I've never had shoofly pie before, but the name is so fun! Looks great! Your pictures get better and better every time. What a wonderful post. I'm sure your mother will love reading it. And good job on such a fantastic looking pie. Your mom sounds awesome and so does your pie! I've never made shoofly pie. I will have to give it a try. I have the mild variety of molasses in the cupboard...is that what you used? I have never heard of shoofly pie before!!! It looks incredible! I love the spices in it. I love Amish shops, that one looks amazing!!! And your pie looks perfect! your Aldi sells goat cheese? mine does not! I'm jealous!!! 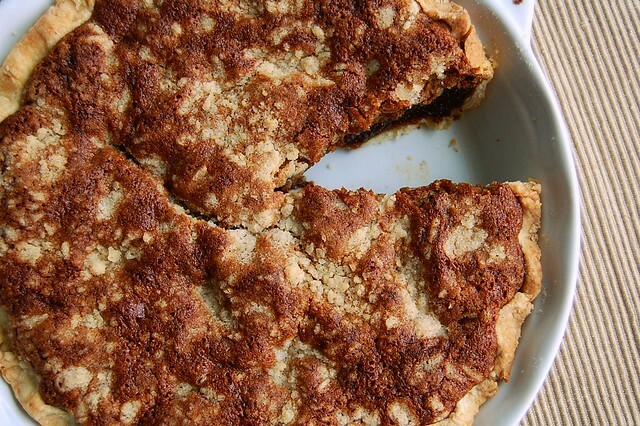 I've never heard of shoofly pie, but your version does sound good and the pictures look even better! 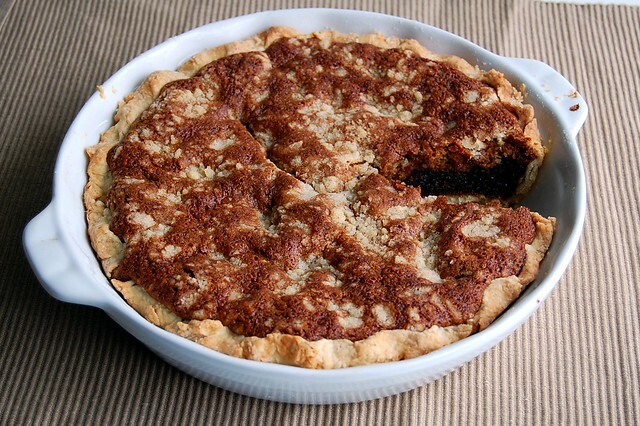 I've never heard of shoofly pie, but it looks tasty! what a wonderful tribute to your mom! that pie looks yummy too! i'm so glad you made this tasty treat--it's been a favorite of mine for a long time! Never made had this pie before but it sure looks good! 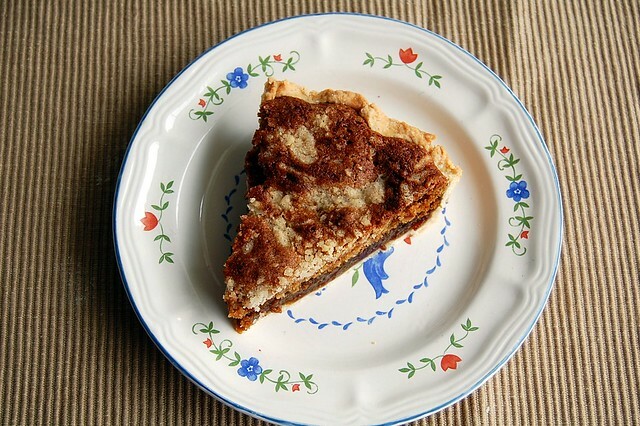 This looks great... as a kid my family often stopped for shoofly pie while driving through PA Amish country. I do have a question though, how would it sound to substitute maple syrup for corn syrup? Being from upstate NY, that's required for pecan pie as well. That store sounds like the best place EVER. I would want to sleep in there just to look at jars of apple butter.